Jamaica’s Net International Reserves (NIR) totaled US$3,106.57 million as at April 2018, reflecting an increase of US$32.00 million relative to the US$3,074.57 million reported as at the end of March 2018 (see figure 1). 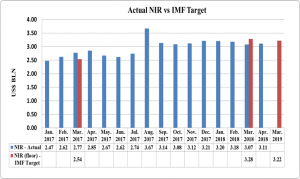 Changes in the NIR resulted from an increase in Foreign Assets of US$25.75 million to total US$3,682.66 million compared to the US$3,656.91 million reported for March 2018. ‘Currency & Deposits’ contributed the most to the increase in Foreign Assets. ‘Currency & Deposits’ as at April 2018 totaled US$3,088.21 million reflecting an increase of US$27.97 million compared to US$3,060.24 million booked as at March 2018. ‘Securities’ amounted to US$323.57 million; US$0.71 million more than the US$322.86 million reported in March 2018. Foreign Liabilities for April 2018 amounted to US$576.09 million compared to the US$582.35 million reported for March 2018. Liabilities to the IMF accounted for 100% of total foreign liabilities, reflecting a US$6.25 million decline month over month from March 2018. At its current value, the NIR is US$257.70 million more than its total of US$2,848.87 million as at the end of April 2017. The current reserve is able to support approximately 36.08 weeks of goods imports or 21.44 weeks of goods and services imports. All performance criteria for the period ended December 2017 were met. The IMF further noted, “Financial sector stability is a prerequisite for strong and sustained growth. Ongoing prudential and supervisory improvements will enhance systemic stability.” “Continued reform implementation will not only safeguard hard-won gains but also deliver stronger growth and job creation.” The Net International Reserve (NIR) target outlined as per the new agreement for the 2018/19 fiscal year is US$3.22 billion (see figure 2 above). As at April 2018, the Country is US$0.11 million below targeted amount.